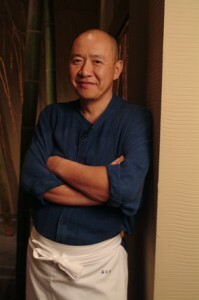 On August 1, Michelin-starred Chef Masa Takayama will debut Tetsu, his first teppan concept at ARIA Resort & Casino. Tetsu will deliver an intimate dining experience featuring the fresh, high-quality ingredients, and unparalleled culinary techniques for which Chef Masa is renowned. Tetsu will feature highly skilled teppan chefs overseeing six grills - four blackjack-style tables and two communal teppan grill tables seating five and 10, respectively. A produce table serves as the room’s centerpiece, displaying the finest quality meats and seafood; and offering guests the opportunity to select the proteins for their entrée, specifying the exact cut, portion size and preparation style they desire. The à la carte teppan grill menu allows guests to taste a variety of offerings such as the Toro Tartare with Caviar, Sizzling Jalapeño Octopus and Oyster with Tomatillo Ceviche. Other main course grilled offerings range from Center-Cut Lamb Chop and Herbed Chicken Thigh to Foie Gras. For the full Masa experience, Chef’s world-renowned sushi and sashimi also will be available, including delicacies such as Toro Fatty Tuna, Giant Clam and Live Shrimp. Served chilled as well as grilled, the incredibly fresh, skillfully sourced seafood such as Sea Bass from Chile, Scottish Salmon and Maine Lobster Tailprovides a diverse selection that will delight guests. Side accompaniments including Yakisoba Noodles, Garlic Butter Fried Rice, Habanero Shrimp Nuggets and Spicy Mango Zucchini Julienne Salad will complement the main course. Masa’s unexpected and refreshing desserts - such as his famous Truffle Ice Cream, Grapefruit Granite and Yuzu Sorbet - will complete the meal. 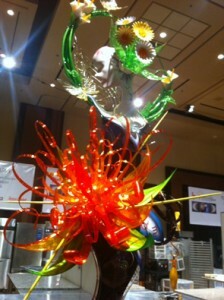 On July 8th and 9th The 2012 World Pastry Team Championship showcased the best in the pastry arts at the Red Rock Casino, Resort and Spa in Las Vegas. 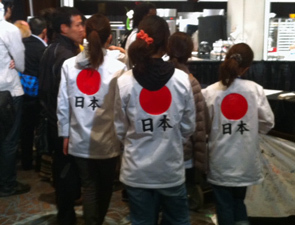 Seven teams competed including Japan, the reigning world champion, which presented the most stunning culinary creation and again captured this year’s world title. USA was a very close second, only a few votes separated these two teams both of which demonstrated incredible skill, finesse and expertise. This year’s zodiac theme was required to be incorporated into: one sugar showpiece, one chocolate showpiece, one chocolate and sugar tray, three different types of chocolate bon bons, one entrement, three different types of petites gateaux, one entrement glace, and one plated dessert. Each of the categories had specific guidelines which needed to be adhered to and superbly executed. The plated dessert is perhaps the only one that the chefs had a freestyle format providing them with more leeway since there were no restrictions on the number of components or shapes to each dessert. 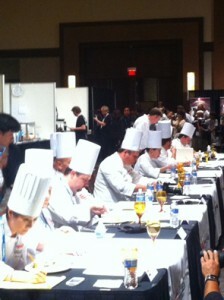 For the majority of the competition the judges scrutinized the accomplished chefs’ precision. This year judges included representatives from every country in the competition including those who chose to remain “unaligned” including Las Vegas’ Chris Hammer, the youngest American pastry chef to win the 2004 title of World Pastry Champion, owner of The School of Pastry Design and winner of Top Chef Just Desserts, and Vincent Pilon, Executive Pastry Chef, Mandalay Bay, Las Vegas, Nevada. President of the jury, Robert Ellinger, C.M. B, C.E. P. C., Chef/Owner of Baked to Perfection, Port Washington, New York presided over the jury. Ellinger is the Founder and President of the Guild of Baking and Pastry Arts in addition to having served as Executive Pastry Chef at the Metropolitan Opera and The United Nations. The multitude of auspicious judges had an exceedingly difficult decision to crown the new winners due to the incredible talent and expertise that was showcased in this two day competition. 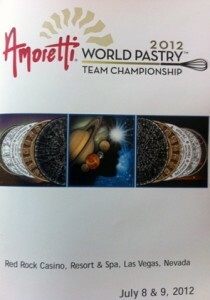 As the competition heated up the ballrooms of the Red Rock Hotel provided a place where sponsors such as Amoretti, ABS (American Baking Systems), AUI (a gourmet food company), E. Guittard (creators of fine artisan chocolates) along with many other purveyors and distributors of everything related to the World of Pastry shared samples and demonstrations. The professional chefs held many demonstration classes which were filmed for the first time, thus making these classes available for purchase anywhere in the world. Also available for pre-order was the competition’s first professional cookbook, Plating for Gold, a compilation of the plated desserts from the 2010-2011 competition. From informative demonstrations to the premier of one of the first “Sugar Arts” culinary schools, the rooms were alive with the energy and enthusiasm from the best in the industry. All the while, the most innovative Pastry Chefs were busy creating and crafting their most elaborate and sophisticated pastry perfections that were showcased for all participants before the gala dinner. 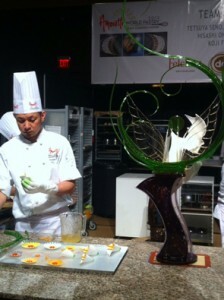 The winning Team Japan’s “Zodiac” sugar showpiece was indeed a marvel; one in which photos only hope to capture. They had flown in their own cheerleading squad to help bolster enthusiasm as they went on to maintain their crown. 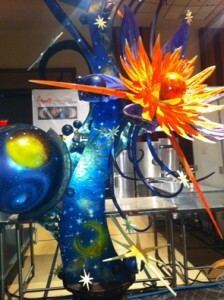 For all those involved in the pastry industry, this was a culmination of years of hard work and passion. One can see why many are motivated to embrace the career of a pastry chef; it is one of creativity, art, passion, skill and beauty. No wonder dessert is served last at a meal. It stands as the best thing to be remembered, and this successful event reflected that sentiment. 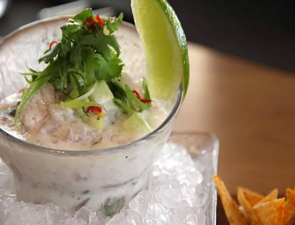 Origin India Restaurant and Bar is spicing up the season with a new happy hour menu. With all offerings priced under $6, guests can preserve their wallets while indulging in a selection of authentic Indian dishes with a modern flair. Offered on weekdays, from 5pm to 7pm, the menu offers an outstanding variety and value for guests to enjoy. The menu includes sensational dishes such as Murgh Malai Tikka (Chicken breast marinated with cheddar cheese and yogurt cooked in the tandoor); Kathi Rolls (Wraps with choice of chicken, lamb or paneer served with fresh salad and chutney); Kalmi Kebab (Chicken drumsticks marinated with Indian spices and herbs cooked in the tandoor); Fish Amritsari (Lightly battered tilapia fish deep fried and served with chutney); Samosa Chaat (Crispy fried samosas served with chickpeas); Chili Garlic Mushroom (Cup mushroom stuffed with cheese and tossed with garlic sauce); Hara Bara Kebab (Fresh spinach and chickpeas patty served with chutney) and Cheese and Onion Bhaji (Mozzarella cheese and onion patty served with tamarind chutney). 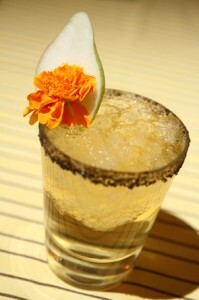 To complement the happy hour menu, Origin India also offers specially priced drinks. Guests will be able to enjoy all beer, wine and well alcohol for 50 percent off during happy hour. Origin India offers a full bar with a variety of signature handcrafted cocktails, diverse wine list, and a beer list that offers exceptional imports including Kingfisher, Taj Mahal, Krait Prestige, Paulaner and Haywards 5000. Located across from the Hard Rock Hotel & Casino, just East of Las Vegas Blvd., Origin India is open daily from 11:30am to 11:30pm. 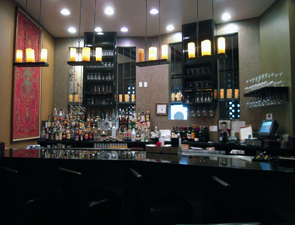 For more information about the restaurant, visit www.OriginIndiaRestaurant.com or call (702) 734-6342. 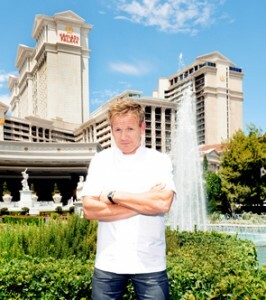 Caesars Palace is pleased to announce internationally renowned Chef Gordon Ramsay will expand on his relationship with Caesars Entertainment and open his second Las Vegas restaurant, Gordon Ramsay Pub & Grill, in late 2012. The new contemporary yet casual restaurant and bar will serve lunch and dinner and will be located in the heart of the resort adjacent to the premiere entertainment venue, The Colosseum, replacing Bradley Ogden restaurant. Michelin Star Chef Gordon Ramsay, known not only for his superior cuisine, but also his popular TV personality on the FOX Network programs “Hell’s Kitchen,” “MasterChef” and “Kitchen Nightmares,” has emerged on the Las Vegas culinary scene with rave reviews at the newly opened Gordon Ramsay Steak at Paris Las Vegas. Gordon Ramsay Pub & Grill will provide his fans another outlet to enjoy the chef’s award-winning skills in a lively and approachable English pub-style setting, offering the finest casual food utilizing the freshest ingredients. The menu at Gordon Ramsay Pub & Grill will be comprised of items consistent with British pub food-bangers and mash, fish and chips and roasted chicken-as well as some of Ramsay’s favorites like London broil prepared on a wood-burning grill, all part of a rustic menu that will change seasonally. Paying homage to a true pub, the new restaurant will feature a wide selection of craft and microbrews from around the world, offering beer enthusiasts more than 40 beers on tap. “I am overwhelmed by the support Gordon Ramsay Steak has received by guests and our Caesars Entertainment partners, and I’m excited to now bring some more of my favorite cuisine and an authentic pub experience to Caesars Palace with Gordon Ramsay Pub & Grill,” said Ramsay. EDG Interior Architecture + Design will create a space that is welcoming, high-energy and comfortable utilizing distressed woods with cheeky references to historic and iconic events throughout the space. The centerpiece of the space will feature a striking bar with an array of beer taps on display and the backdrop inspired by traditional London red telephone booths. Gordon Ramsay Pub & Grill will take advantage of its location with a patio area extending onto the casino floor where guests can be in the middle of the action. Kegs will serve as a major part of both the dining experience and the design while pop culture relics from both England and the United States will fill the walls. The 290-seat restaurant will include an impressive bar, a vintage-style lounge, a series of casual dining rooms and a private dining room, giving guests a variety of culinary experiences to fit any mood. Marché Bacchus French Bistro and Wine Shop will host a very special wine dinner featuring a five-course tasting menu created by Master Chef Alex Stratta and Executive Chef David Middleton. The menu will be expertly paired with fine, handcrafted wines from David Arthur Vineyards. Featured wines for the evening include the winemaker’s Sauvignon Blanc, Meritaggio Sangiovese Blend, Three Acre Cabernet Sauvignon, Elevation 1147 Cabernet Sauvignon, and a Late Harvest Riesling. All wines will be available for purchase during the course of the evening, including Elevation 1147 Magnums and one very special etched 6L bottle. 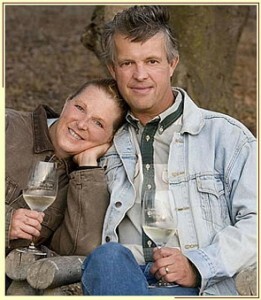 In addition, David Long, owner of David Arthur Vineyards, will be available for a wine bottle signing. 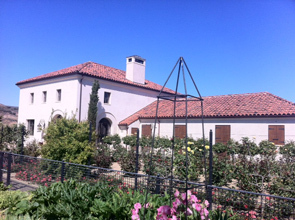 David Arthur Estate is located high on Pritchard Hill, on the eastern side of the Napa Valley. Established by David, Joye and Bob Long in 1985, David Arthur is dedicated to producing handcrafted wines that express the unique terroir of its estate. Despite the exceedingly rocky terrain, the vines of David Arthur produce wines with lush fruit character and silky tannins. www.davidarthur.com. James Beard Award-winning Chef and restaurateur, Alex Stratta, is regarded as one of the top chefs in the world today. A consultant with Marché Bacchus, Stratta was previously executive chef of ALEX, the award-winning (Michelin Two-Star, AAA Five-Diamond, Mobil Five-Star) French fine dining restaurant at Wynn Las Vegas. 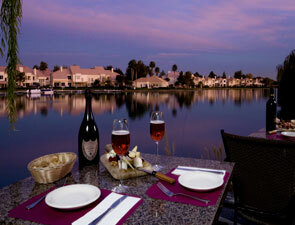 In addition, Stratta was featured on the third season of the popular Bravo TV program, Top Chef Masters. Thursday, August 16, 2012. A reception will begin at 6:30 p.m. followed by dinner at 7 p.m.
$95 per person (excluding tax and gratuity). 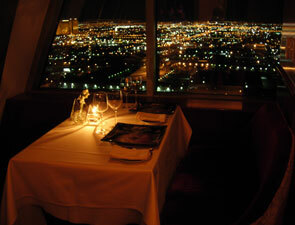 Space is limited and reservations can be made by calling (702) 804-8008. BLT Steak at the Betsy is providing a sneak peek beginning Wednesday, July 25, 2012, for those who can’t wait for the Greater Miami Convention & Visitors Bureau’s much anticipated Miami Spice Restaurant Month to launch the following week on Wednesday, August 1. The acclaimed dining destination, which recently opened a new raw bar and sushi bar, will roll out its Miami Spice dinner menu ($39) which will remain in effect through the official Miami Spice kickoff on Wednesday, August 1 (Miami Spice menus will not be offered on Fridays & Saturdays). Talented chef de cuisine Matthew Oetting perfectly executes Tourondel’s vision - and incorporates his own flair. For dinner, the BLT Steak three course menu is taken to the next level - not only does it include a choice of several delicious side dishes to accompany the main course selection, there are several complimentary additions including the restaurant’s legendary Gruyere popovers and chicken liver pate upon seating, as well as mouthwatering house made madeleines at the meal’s end. Additionally, there will be a three course Sommelier Selections wine pairing available for a $25 supplement, with selections from boutique wine producers and obscure varietals perfectly paired with each menu item, specially chosen by BLT Steak General Manager David Weiss. Dinner menu follows; tax and gratuity not included. Beginning August1, BLT Steak will also offer a Miami Spice lunch menu ($23) that will be available Mondays through Fridays throughout the length of the promotion - please check the Miami Spice website at www.ilovemiamispice.com for that menu. BLT Steak is located at The Betsy South Beach, 1440 Ocean Drive, South Beach, FL 33139. Open seven days a week, serving breakfast 7 AM - 11 AM, lunch 11 AM - 2:30 PM, and dinner 5 PM - 11 PM. For reservations please call 305-673-0044 or visit thebetsyhotel.com/dining/blt-steak. 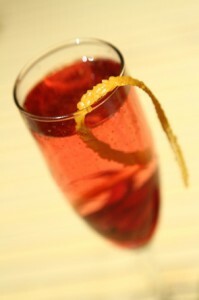 Payard Patisserie & Bistro has launched a new menu of enchanting wine cocktails sure to excite any wine enthusiast. This collection of red, white and sparkling cocktails, created by manager Sam Berkley, are especially unique as they contain no spirits, just wine. Poire Chaude (Hot Pear): A mélange of Ecco Domani moscato and pear cider, Berkley has added some heat to this light cocktail with a cayenne pepper and sea salt rim along with a pear slice and edible flower garnish. 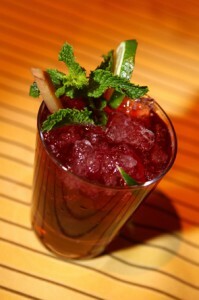 Mojito Rouge (Red Mojito): A twist on the classic drink, Berkley uses muddled mint and lime to add a new dimension to a Louis M. Martini cabernet sauvignon, with agave nectar and soda, all garnished with a lime, mint sprig and a sugar cane. Le Classecco (The Classic Prosecco): Lamarca prosecco is reminded of its Italian heritage with drops of balsamic, garnished with a hibiscus flower and an orange twist. Pair one of these extravagant cocktails with the new steak frites, a New York strip steak topped with housemade beurre maitre’d hotel butter sauce and served with French fries, available during dinner service for $25. Payard Patisserie & Bistro is designed to evoke thoughts of a classic Parisian pastry shop. Rich and vibrant colors dominate the space as hand-crafted woodwork, crystal, blown glass and leather banquettes complete the restaurant’s elegant feel. Payard offers guests three distinct experiences, including a chocolate shop, a pastry shop with made-to-order crepes, and an intimate full-service dining room. Dining room hours are 6:30 a.m. to 3 p.m. daily and 5 p.m. to 10 p.m. Wednesday through Sunday. The walk-up counter and retail area is open daily from 6 a.m. to 11 p.m. Reservations can be made by calling 702.731.7292. Julia Child once noted, “The only time to diet is while you’re waiting for the steak to cook.” Happily, at Andre’s and Alize restaurants in La Vegas, we couldn’t agree more. Andre’s at the Monte Carlo Resort and Alize at the Top of the Palms Casino are celebrating Julia Child’s upcoming 100th birthday with a week-long special menu that offers her most cherished recipes. As Las Vegas’ first Celebrity Chef to introduce fine French dining in 1980, it seemed only appropriate that Andre Rochat work in concert with his renowned Chefs de Cuisine, Mark Purdy and Chris Bulen, to create Julia Child’s Celebration Menus for the entire week of Aug. 7th - Aug. 15th. Guided for more than five decades in the finest traditional French training and cooking, Andre’s namesake restaurant is offering a Julia Child’s Celebration Menu that includes items such as Smoked Salmon Parfait, Lobster al’Americaine en Croute, Petite Filet of Beef Rossini and Baked Alaska. View the entire Andre’s Celebration menu here. At Alize, Andre’s traditional French flair takes on more of a modern edge, and its own Julia Child’s Celebration Menu reflects the same. For this single week in August, Alize is featuring items such as Foie Gras Terrine with Port-Poached Figs, Sauteed Dover Sole Meuniere and one of Julia’s finest, Grand Marnier Souffle. View the entire Alize Celebration menu here. It’s our way to show respect and esteem for Julia Child and, at the same time, let our chefs enjoy working with these timeless recipes,” says Rochat. Chef David Burke-Hosted *Hootenanny* Friday, July 27, 6 - 11 p. m.
“Friends of the Farmer” Festival, Saturday, July 28, 11 a.m. -6 p.m.
For a second consecutive year, Farm On! Friends of the Farmer Festival is organizing two “fork it over” fundraising events at the Copake Country Club in Columbia County, comprising *Hootenanny! 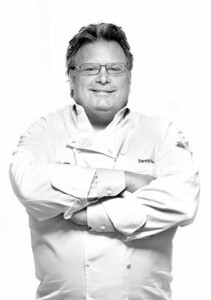 * a Five Mile pig roast (all food gathered within five miles) hosted by star-chef and restaurateur David Burke on Friday, July 27 from 6- to 11 p.m., and the “Friends of the Farmer Festival,” an all-day food lovers festival held on the beautiful Copake Club golf course, from 11 a.m. to 6 p.m. With a mission to raise both scholarship funds and awareness for agriculture students and the future of farming, beneficiaries include the Cornell University’s Cooperative Extension program, along with QuestarIII and 4H. Founded and produced by the Culinary Partnership, a food launch consulting company owned by local business woman Tessa Edick, the first day of the festival begins with an optional “Five Mile Farm Tour,” from 9 a.m. to -11 a.m., in which guests are invited to visit three area farms as a prelude to festival. The tour, which is being offered on a first-come, first-serve basis, is intended to bring consumers to the farm in the “know your farmer, know your food” mission. Following the farm tour, at the festival, consumers will gather to eat, learn and experience all things agriculture; farmers, food purveyors, local businesses and residents from the Greater Hudson Valley in a celebration of food. In addition to this year’s scholarship goals, funds are being set aside to sponsor a one week “summer camp” for 20 Hudson Valley students who will visit local farms and be introduced to the business of farming. The accredited program is designed to provide adventure based learning for the basics of farming with start ups. Last year’s inaugural event attracted more than 1,300 visitors who for a $10 admission to the Saturday event, feasted on local fare that included five mile grilled burgers and chicken, seasonal fruits and vegetables, local ice cream, pies, candies, jams and much more. Education was paired with experience to meet your farmer, have a local beer, ask questions, dance to live music, learn catch & release at the fishing derby and at the end of the day, over $5,000 was raised for the FarmOn! Scholarship Fund. Highlights planned for the 2012 “Friends of the Famer Festival” include a Future of Farming Tent, 5-Mile Farm Fresh Grill, Taste of the Farm Market & Locavore Village, Taste Test Foodie Challenge, Gourmet Picnic Basket Silent Auction, Local Libations Bar, Kid-friendly Activity Tent with Pheasant Release, Antique Tractor Parade, Baby Petting Zoo, Celebrity Picnic Table Auction, Great Stuff + and the “It’s Five O’clock Somewhere” Barn to Belly Meet your Farmer Mixer inspiring Q+A between consumers and farmers for a day of sharing and celebrating the Farmer and his rich gastronomic bounty as the real food celebrity under the summer sunlight of the Hudson River Valley. Among last year’s bold-face sponsors were Rachel Ray, Thom Filicia, Gina Gershon, Fabulous Beekman Boys, Bob +Courtney Novogratz and John Varvatos. Additional sponsors included the Cornell Cooperative Extension, Culinary Partnership, Copake Country Club, Columbia Land Conservancy, Herondale Farm, Coach Farm, Ronnybrook Farm, Cabot Cheese, Millbrook Winery, Chatham Brewers and 45 other local and Tri-State area businesses and residents. In addition in 2012 we add to the list of sponsors for even more farm experiences with support from Whole Foods Market, Royal Caribbean, Bob Lewis, Chef David Burke, Farm to Consumer Foundation and Gigi’s Hudson Valley. Copake Country Club is located at 44 Golf Course Road, Craryville, NY12521 overlooking Copake Lake between Catskill and Berkshire Mountains. For more information about the events, directions and to purchase tickets, go to www.FriendsoftheFarmer.com or call 518.325.9437. It is said that one of the most defining aspects of a grape varietal is its sense of place. It has a signature that many times makes it unique and unmistakable. Even Journalists who share their experiences with their ever eager readers have a sense of place, a place that brings memories screaming to the forefront of their consciousness, a place where it all began for them. Recently we returned to our sense of place, to the familiar smells, wines, food and people that gave us our own signature and unique sense of place. To a place where it all began for us and sent us on an incredible journey and a new career. The beautiful Sta. Rita Hills and the Santa Ynez Valley in California’s Santa Barbara County. The quaint coastal town of Morro Bay was the trailhead of our journey south back to our roots. As the familiar morning fog was beginning to reveal the Historic Morro Rock we headed out for a few planned stopps as we continued our journey down the Highway 101. We turned east toward Templeton, away from the coast, for a stop at Pomar Junction Vineyard and Winery. The very scenic 30 minute drive took us through fertile farm land and vineyards as the warmth of the Sun broke through to start a cloudless day. Turning on El Pomar Road, the Vineyards of Pomar Junction came into view. Their Historic Railroad Box Cars signaled the entrance to their tasting room and we had arrived at our first stop. Owner Dana Merrill and Winemaker Jim Shumate met us in the tasting room to show us around. And they certainly did! After tasting through their wonderful sustainable wines, Dana took us for a tour of his Vineyard that ended up at the Winery where Jim Shumate gave a preview of upcoming vintages with a barrel tasting. 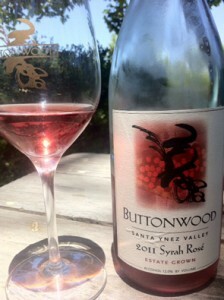 A tasting room lunch and a lovely bottle of Pomar Junction Syrah Rose 2011 on the patio overlooking the vineyard was the perfect way to start the afternoon. We continued our travels south on Highway 101 with the Pacific Ocean over our right shoulder and we met up with fellow journalists for lunch and bubbles at the Laetitia Winery. There is probably not a much prettier drive than Highway 101 from Morro Bay South. Arriving at the tasting room we met up with our journalist colleagues, tasted some very elegant sustainable wines and enjoyed a lunch under the trees as we shared stories and savored Laetitia Brut de Blanc, Brut Rose and Brut Cuvee Sparking wines. We said our goodbyes and continued south on Highway 101, next stop, our sense of place! A short southerly drive on Highway 101 brought us to Lompoc and Highway 246. It has been almost two years and now we were home! The Santa Rita Hills always feels like home to us because this is where it all started, and here driving down Highway 246 evokes memories and goose bumps. In this area the Vineyard owners and Winemakers are still “farmers,” they walk the vineyards, many still hand sort Syrah, Pinot noir and Chardonnay and they have opened their homes to us for many years. We have long-term relationships and good friends in this area and some new friends as well. On this visit, John Hilliard and Christine Bruce owners of HilliardBruce Vineyards graciously opened their 100 acre Estate to us as our “base of operations “for the next few days. 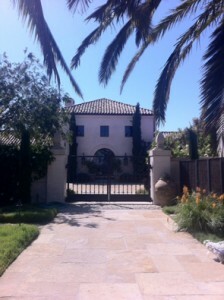 Driving into their estate was like driving into a movie set reminiscent of entering emerald city. 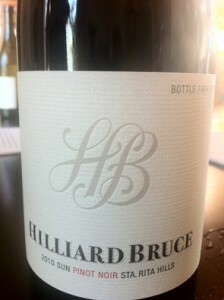 After being introduced to their Arabian horses we took a stroll through the garden , pastures and vineyards as we sipped on HilliardBruce Sun Pinot Noir Sta Rita Hills 2010 and watch the setting sun behind the Sta Rita Hills and the Pinot Noir making “seasmoke” settle on to the vineyard. The Lompoc Wine Ghetto is relatively new and home to many of the area’s finest wineries all in one place. On this occasion we had to stop in and visit the legendary Kathy Joseph and her Fiddlehead Cellars tasting room right in the middle of the action. Kathy is a true legend and one of our mentors who greatly influenced and educated us on the art of winemaking. 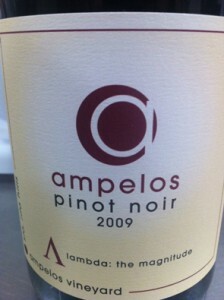 We sampled her lovely wines and even her special legendary Lollapalooza Pinot Noir. 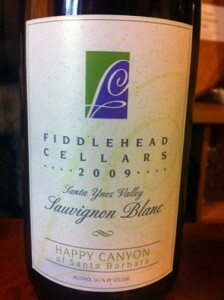 Of course we had to take a bottle of the Fiddlehead Cellars Sauvignon Blanc to enjoy later on! Heading south on 246 memories rush back into our minds like a freight train as we pass the La Purisma Mission and then the Vineyards of Clos Pepe, Babcock, Foley, Melville and then into Buellton, its tasting rooms and of course The Hitching Post Restaurant. The next town is the Dutch inspired town of Slovang which is always worth a stop, but on this visit we had a lunch date to keep. Still on the Vineyard gauntlet of Highway 246 we turned on to Alamo Pinto Rd and stopped in for lunch under the buttonwood trees at Buttonwood Farm and Winery with winemaker Karen Steinwachs. With the warm sun of the Santa Ynez valley breaking through the Buttonwood trees, Karen started us out with her lovely Sauvignon Blanc 2010 and of course the very famous Zingy 2011 and even a Grenache Blanc. 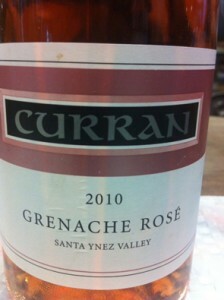 Then it was on to her Syrah Rose, Merlot, Cabernet Sauvignon, Trevin 2007, Syrah and Grenache as the lunch progressed. It is always a pleasure to come home and find our sense of place under the Buttonwood trees with a legendary winemaker like Karen as she spoke about the wines and vineyards under the shade of that very special place.